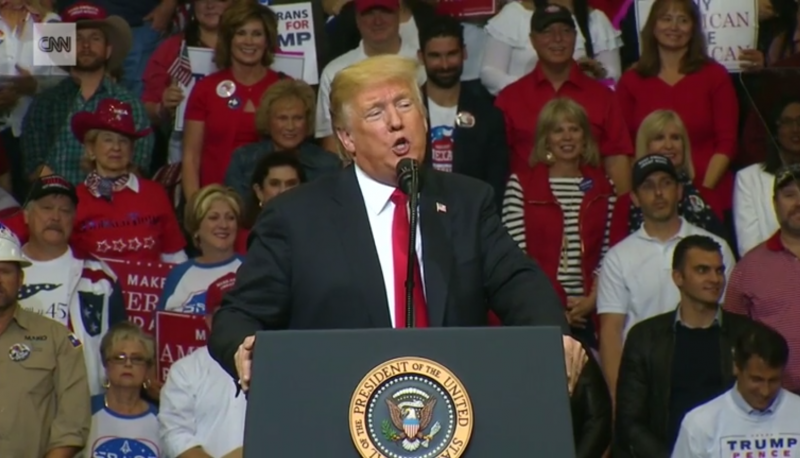 President Donald Trump told the crowd at a rally in Houston, Texas, last night that he was a “nationalist,” thrilling some of his most far-right supporters. “You know, they have a word. It sort of became old-fashioned. It’s called a nationalist,” Trump said, “And I say, ‘Really, we’re not supposed to use that word?’ You know what I am? I’m a nationalist, OK? I’m a nationalist. … Use that word.” As The Washington Post’s Aaron Blake pointed out, Trump had previously called himself a nationalist in February 2017. Prior to last night’s rally, the Trump administration has been careful about always adding qualifiers to any use of the word “nationalism” in order to deflect allegations of a racist agenda. Steve Bannon, who led Breitbart News as the platform for the “alt-right” and served as White House Chief Strategist for Trump, frequently qualified his support of nationalism to be “economic” nationalism. “Nationalism” as a term has been wielded by far-right autocrats in Europe to pitch their governing style as an alternative to so-called “globalist” efforts to solve economic and foreign policy issues with collaborative efforts within the European Union. But naturally, Trump’s embrace of the term without qualifiers thrilled many of the white nationalists supporting Trump, who interpreted his remark to be an endorsement of their agenda, which calls for the United States to craft policy around the interests of a federally enforced white supermajority. It is worth noting that a smaller handful of white nationalists, particularly those who also hold vehemently anti-Semitic beliefs, are still somewhat skeptical of Trump calling himself a “nationalist” because they don’t believe his administration has sufficiently advanced its own idea of a “nationalist” agenda. 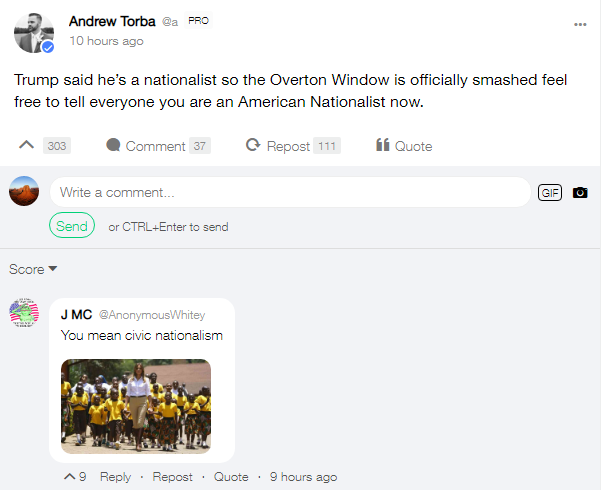 As Michael Edison Hayden, a news intelligence analyst with Storyful points out, neo-Nazis tied into the alt-right made a push in 2017 to rebrand their movement as “American Nationalism” after the alt-right was linked to murder and extremism. When you see people using Trump’s “nationalist” remark to ID as “American Nationalist” — it’s also just a euphemism for white nationalism. Ann Coulter, a conservative pundit with clear ties to the white nationalist movement, wrote that Trump was “sounding like Breitbart” because the midterm elections are approaching. Jack Posobiec, a One America News commentator with a history of mingling alongside far-right figures like Richard Spencer, said he was a nationalist just like Trump.
. @realDonaldTrump was stunning and brave tonight to come out of the closet as an American Nationalist. This anti-nationalist bigotry in media and culture must not stand. Hate of nationalists is hate of freedom. Henrik Palmgren of the web-based white nationalist radio station Red Ice posted approvingly of Trump’s remark. Dinesh D’Souza recently produced a film alleging that Democrats are the real racists, and not the unabashed white nationalists within the Republican Party. After Trump’s “nationalist” remark, D’Souza defended Trump by comparing him to various world leaders.